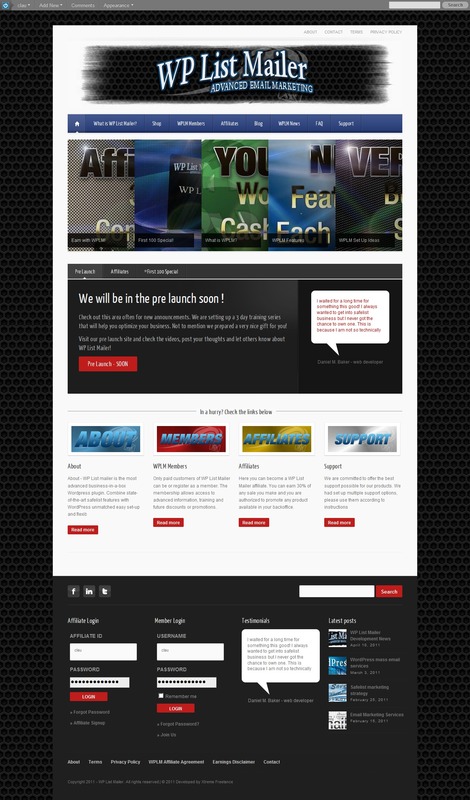 WP List Mailer launching soon! I know we very seldom get to publish our work as a team here at Xtreme Freelance. Part of this is because many projects we’ve worked or work now are still NDA and others are very technical, so we present these only to our potential clients. This of course is not the case for Xtreme Blogs System – you can say this is our front project 🙂 However now we have the chance to unveil for the first time a big project that was entirely developed by Xtreme Freelance team – WP List Mailer ! WP List Mailer is a unique project, developed from the ground up. We will only introduce it to you for ow and we will get back with a more in-depth presentation. So, WP List Mailer is a WordPress plugin that will help blog owners to quickly add a new stream of revenue from their blogs, using existing traffic! WP List Mailer is based on the proven safelist system, which we took and adapted to be used in the WordPress environment. The most powerful part is the continuous development business model. This means that WP List Mailer team will develop the software on the ongoing bases, adding new features, improving existing ones and catering to customers needs! Make sure to follow us here or visit the WP List Mailer and make sure you get to be a part of the pre-launch, or even better become an affiliate and earn some serious cash! Visit now WP List Mailer !